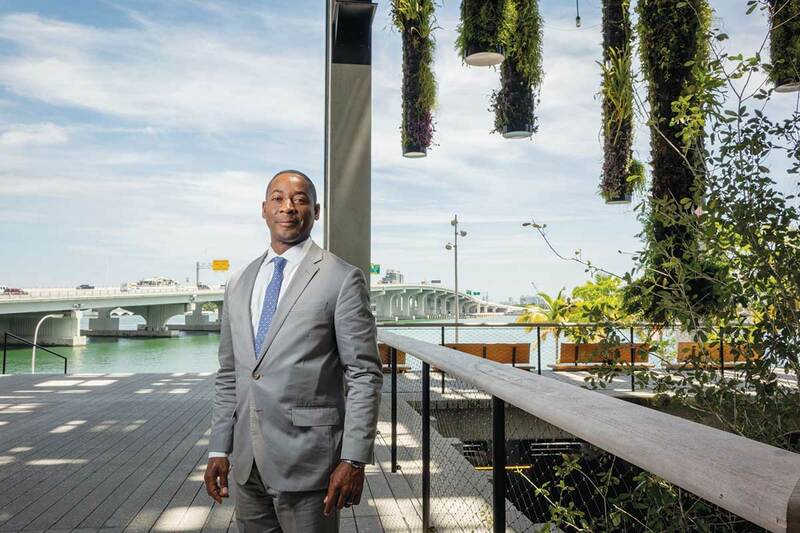 Pérez Art Museum Miami – along with its predecessor institutions – is coming up on its 35th anniversary of bringing modern and contemporary art to South Florida and is now looking at the potential to create a center to study Caribbean art within the building, according to CEO Franklin Sirmans. By the end of 2018, Mr. Sirmans said, he expects that 250,000 to 300,000 people will have visited the museum this year. Currently, the number of visitors for 2018 is nearing 200,000. The year’s total of visitors is much lower than in 2017, which Mr. Sirmans attributes to the 2017 opening of the Phillip and Patricia Frost Museum of Science next door. However, the museum is now moving into a five-year plan, Mr. Sirmans said, which it will use as a guideline to “highlight ourselves as a destination for art.” Several smaller and major events are planned for the fall, starting with a documentary exhibition about Christo and Jeanne-Claude, who in 1983 used 6.5 million square feet of woven polypropylene fabric to surround 11 islands in Biscayne Bay using Styrofoam, steel cables and an anchoring system. In November, Pérez Museum will welcome Ebony Patterson, “a woman who divides her time between Jamaica and Kentucky. It’s a pretty amazing show of a mid-career artist,” Mr. Sirmans said. The museum is also planning on starting another group of exhibitions around Latin America and Latinx. Latinx is the gender-neutral alternative to Latino or Latina. This is very important! We need to showcase our Caribbean artists – they need recognition and are extremely good artists Thank you! Every museum needs to be known for one thing it does better than others. Given our population and proximity to the Caribbean specializing in Caribbean artist is a natural fit. Along with rotating exhibition of various mediums it should make the Museum unique. The art at PAMM, to put it mildly, is terrible. Such a nice building to showcase literally garbage. I fail to see any artistic value in the majority of exhibits. Perhaps I don’t see value in the displaying of thousands of dirty flip flops or feather dusters in a case or bizarre pieces related to soccer. Please hire a new director who has a better vision on what art is. Could care less where it comes from. Just stop showing garbage. I can see better garbage in the underpass nearby.